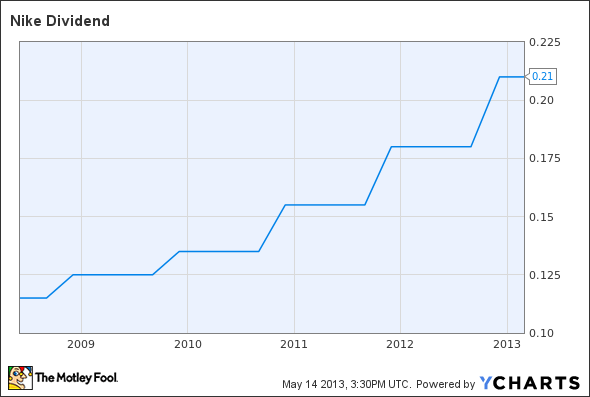 Sneaker maker has paid a quarterly dividend since 1984. Sneaker maker Nike(NYSE:NKE) will pay a quarterly dividend of $0.21 per share on both its class A and class B shares, the same rate it paid last quarter after raising the payout from $0.18 per share. The dividends have been adjusted to reflect the 2-for-1 stock split effected on Dec. 24, 2012. The board of directors said yesterday that the quarterly dividend for the fourth quarter of its fiscal year is payable on July 1 to the holders of record at the close of business on June 3. Nike has paid a quarterly dividend every year since 1984. The regular dividend payment equates to an $0.84-per-share annual dividend yielding 1.3% based on the closing price of Nike's stock on May 13.